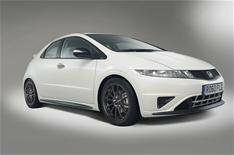 Honda Civic special edition selling fast | What Car? Honda claims it has sold a fifth of its special-edition Civic Ti before the car officially goes on sale. The Civic Ti is based on SE versions of the small family car, but comes with 3700 worth of equipment and costs 355 less than the standard car. Honda says 500 Civic Ti models will be made 300 with the 1.8-litre engine and 200 with the 1.4 and claims it has already taken more than 100 orders. First deliveries are not expected until April 20. The Civic Ti costs 15,995 with the 1.4-litre engine and 16,995 with the 1.8. The special edition is inspired by Honda's Team Dynamics British Touring Car Championship racing car and comes with unique 17-inch 'Pro Race' wheels and Honda's GP bodykit. It also has a Pioneer Navigation System, with Bluetooth, 3D touch-screen and MP3 player connectivity. The high-end system has an eco-driving function, where GPS systems can tell how efficiently the car is being driven. Honda says it doesn't expect the Pioneer unit to become an option in the rest of its model ranges, however it does concede that more special editions, which come with a high level of kit and a keen list price, are likely. Honda says its UK factory has yet to be affected by any shortage of parts caused by the earthquake in Japan just 8% of components used to build its cars in the UK are sourced there. However, if disruption continues in Japan, operations in the UK could experience supply issues during May.